The bidding war to buy Virgin America between Alaska Air and JetBlue has officially ended, with Alaska Air coming out victorious and acquiring Virgin America for $57 per share in cash. Paying $57 per share comes out to $2.6 billion, however the the deal’s aggregate value is closer to $4 billion. Obviously, this is a huge win for Alaska Air as the airline has now become the fifth-largest airline in the United States. At the moment, Alaska Air plans to “spend a couple of years” figuring out how to best utilize Virgin America’s brand, which is already widely popular in Silicon Valley. 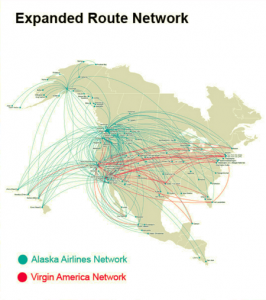 Below you can see how the merger will expand the airline’s route network.